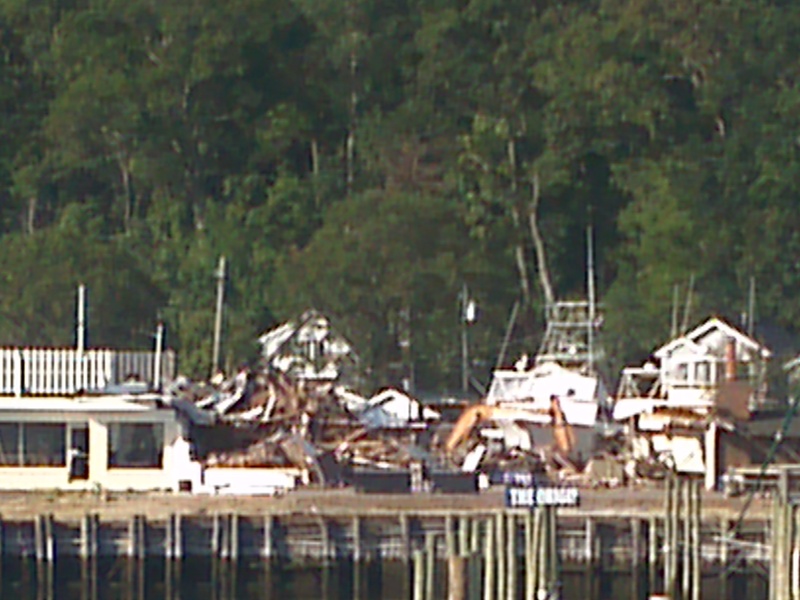 Yesterday marked the official day that one of the Sandy destroyed restaurants was taken down. The Original Oyster was started in the late 1970’s. It was well known as having the best bar scene for both cocktails and a great bar to have dinner at, while you looked over the NY skyline and watched the boats go by on their way to the Atlantic. It went through several transitions, finally being attained by veteran restauranteurs that own/operate The Inlet Cafe, also in Highlands NJ. It had a 100 seat Patio area, separate Tiki Bar/Deck area complete with a band stage. The Tiki area also boasted a Fire Pit for the chillier months ahead. Indoors the sparse tables and walls had all been revamped with linen and fresh new looks along the rooms. The service has been updated as well as the Wine List, great Cocktail/Martini menus, they had also attained the original Chef from the restaurant’s hey day. Sad, but it really hadn’t been good for 10-12 years. Lobster Bob, RIP! I think Doug was doing a pretty good job of bringing it back. The location just didn’t have the draw that it might have, especially after the ferry stop moved. But for a really nice dinner out, with the appropriate atmosphere (unlike the Inlet, which I love, but seems overpriced for the casual feel), they were on their way. Well atleast we still have Gimpie’s! And don’t forget – Beacon on the Bay! the Gimpies’s building looks nicer this year…any news on what is coming there? I heard it was going to be a restaurant. Goodness knows we could sure use one of them around here. WOW! More ratables we are going to lose!!! There go the damn taxes!!! ugh! Thanks Carolyn for everything. I would have been completely in in the dark if it wasn’t for this blog and you broadcasting all the council and town halls. Can’t thank you enough…been a life saver. Also survey really smart idea. I sent out to many people I hope there getting a strong response. Neighbors helping neighbors, right. For the survey, you can’t pass on the link, but you can ask people to register by sending an email to highlandsnjsurvey@gmail.com. Thanks for spreading the word! Right On Sister:) Yes I meant info for link. Well if that’s true….it would explain why Lori Anne never called me back with my order for the Girl Scout Cookies! I guess I’m going to have to find a new dealer.